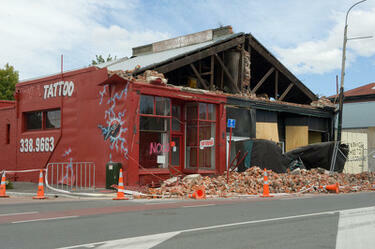 A photograph of the earthquake damaged Persian Tea Rooms on Lincoln Road. Bricks and debris from the building's collapsed roof cover the footpath. 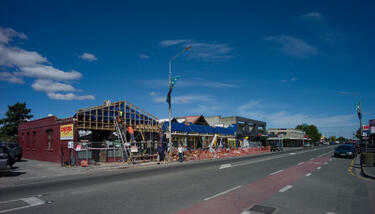 A view across Lincoln Road from Bernard Street to the former Spice 'N' Things building. 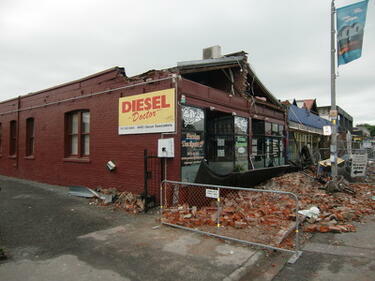 Masonry from the building's upper section have collapsed onto the road. A sign painted beside the building reads, "Spice 'N' Things moved to 208 Lincoln Rd". Workers building a facade on a damaged building on Lincoln Road, soon to be The Pedal Pusher Bar and Restaurant. 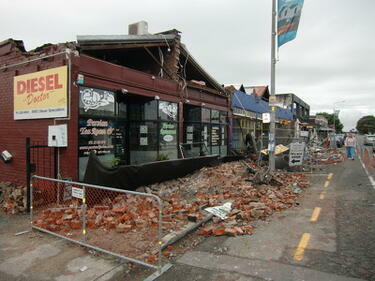 To the right, another shop has also partially collapsed, the debris falling onto the footpath in front. Wire fencing has been placed along the road as a cordon. A damaged building on Lincoln Road. 'No go' has been spray-painted on the front window of the building and the brickwork of the upper front wall has collapsed onto the road. 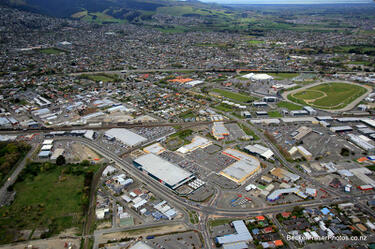 Photograph captioned by BeckerFraserPhotos, "Looking south across Addington". 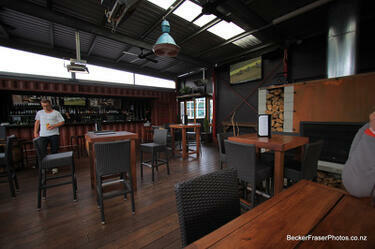 A photograph captioned by BeckerFraserPhotos, "Cargo Bar in a container". 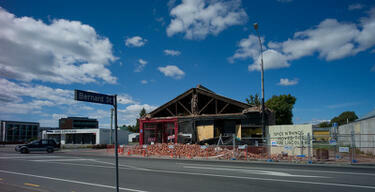 A video about Whare, a gift and homeware store which relocated several times after the 4 September 2010 earthquake. 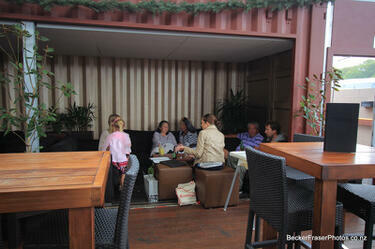 Whare originally had two stores, one in Beckenham, and another on Lichfield Street in the central city. Both stores were closed as a result of the 22 February 2011 earthquake. 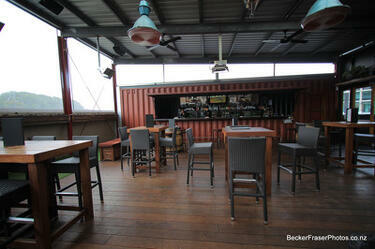 The store reopened temporarily in a garage and then in the Snowride Store on Lincoln Road. 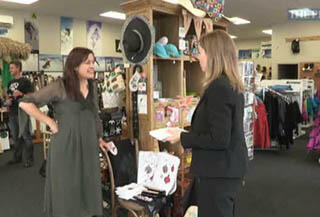 This video was part of The Press's 'Up and Running' series which showcases businesses which have stayed up and running despite the challenges posed by the 2010 and 2011 Canterbury earthquakes. 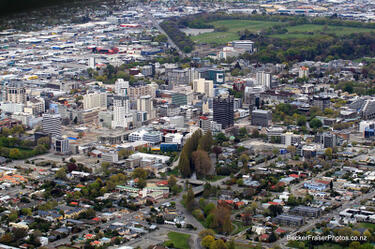 Photograph captioned by BeckerFraserPhotos, "Looking from north east to south west across the CBD". 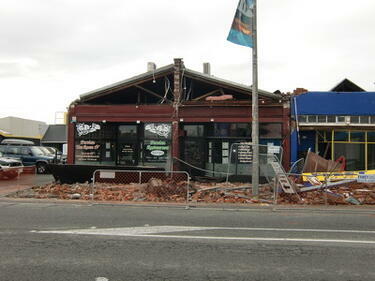 A photograph of the earthquake-damaged Persian Tea Rooms on Lincoln Road. Bricks and debris from the building's collapsed roof cover the footpath. A video of an interview with Defence Counsel Jonathan Eaton about the police's refusal to allow diversion for alleged-looter Cornelius Arie Smith-Voorkamp. 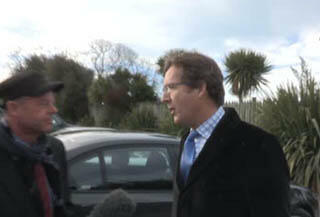 Smith-Voorkamp was arrested for allegedly taking light fittings from an earthquake-damaged property on Lincoln Road. Diversion was applied for on the basis that Smith-Voorkamp has autism, and his Asperger's syndrome involves a compulsion to take electrical fittings.